On our last evening in Beijing, we attended the opening of the Bvlgari 125 Years of Italian Magnificence at the newly-renovated National Museum of China. We all met at the lobby of the Grand Hyatt hotel and then rode one of the many cars lined up on the driveway to ferry guests to the event at the museum near Tiananmen square. We arrived just in time to see the wide expanse of steps and the red carpet all the way up to the museum’s entrance. After hearing a few welcome speeches, the doors to the exhibit were opened and over 1500 guest shuffled their way to the exquisitely displayed jewelry collection. 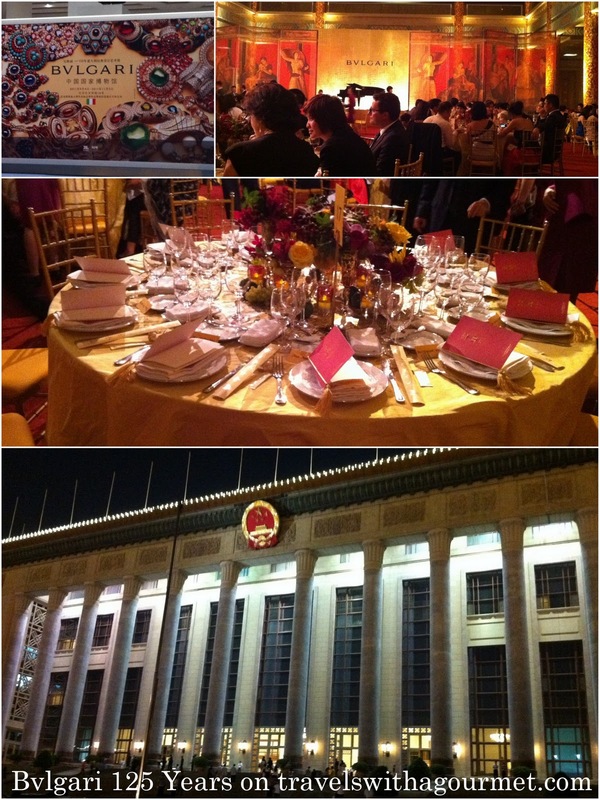 Soon after, we took another car and went off to dinner at the Great Hall of the People, another massive structure just across the square from the museum where a private dinner for 250 guests took place. The hall was impressively ornate and was decorated with large red and gold screens where 25 round tables covered in gold and large flower arrangements. The dinner was a multi-course meal of small Chinese dishes starting with a cold starter of steamed chicken, roast duck and pickled vegetables followed by a clear soup with sea cucumber then a small terra-cotta pot of the classic Buddha jumps over the wall (named thus because Buddha supposedly ate this even if it contained meat since it was so delicious) which had mushrooms, shark’s fin, bamboo shoots and more sea cucumber. Abalone came next then some small dim sum and then the incongruous main course of roast beef with potatoes. Vegetable fried rice came next and finally, some ice cream. During dinner, a soprano and a tenor entertained the guests with renditions from classic Italian operas. We finished at around ten p.m. and headed back to the hotel to pack for our early flight back to Bali the following morning.